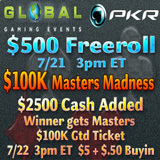 Global Gaming Events is launching its first set of events with PKR this month. The two tournaments will have extra value with $3,000 cash added, as well as a $270 ticket to the PKR Masters $100k GTD tournament. The first tournament is a $500 Freeroll on Saturday July 21st 2012 at 3pm ET. The second tournament follows the very next day, Sunday July 22nd 2012 at 3pm ET with a $5 + $0.50 buyin Event and will have 2 whopping prizes: $2500 cash added to the buyin prize pool, as well as one $270 buyin prize to the PKR Masters $100k GTD Tournament for the first place winner. There will be an additional bonus for all players that have made an initial deposit or reloaded in the 30 days prior to the start of the GGE Buyin and who also play in the GGE Buyin. Each of these players will receive a Masters Step 2 Tournament ticket, valued at $8.25+$0.80. These tournaments are open to everyone and will be password protected. The password for both tournaments is GGEPKR. Full details of the event can be found on Global Gaming Events website www.globalgamingevents.com.